Growing Citrus in containers can often bring a little slice of paradise to the garden and home. Although, this is not a new practice, citrus fruits were a rare luxury in most of the United States during the 1800’s. Citrus trees were often cultivated on seafaring ships to help prevent scurvy. Up until about 1930’s, most citrus grown in containers were reserved for the wealthy homes. However, the revival of home citrus gardening is now a pleasure that can be enjoyed by many people, and many different types of citrus are available through retail garden centers and online marketplaces. However, Citrus cannot be sold in or shipped outside of Charleston, Beaufort, or Colleton counties in South Carolina due the Citrus Greening Quarantine. When purchasing young Citrus, it is important to note that young trees must mature before they will flower. Typically young grafted oranges, grapefruits, and mandarins must grow for 5 years before they will flower and produce fruit. Lemons and limes require 1 to 3 years to overcome juvenility. So, purchasing larger specimens will often lead to quicker fruit production. In general, Citrus trees prefer full sun in outdoor locations, or south facing indoor locations with lots of bright natural light. At least 8 hours of sunlight, as well as high humidity, 30% to 60%, are required for optimum growth and development. 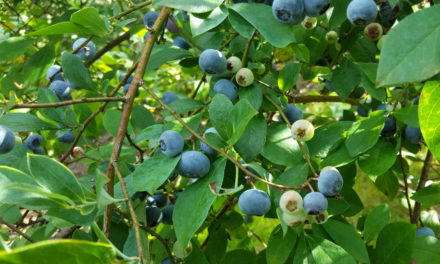 Optimum temperatures for fruit production are between 65°F and 85°F. Most citrus trees can tolerate cooler temperatures, down to around 50°F; however for some, even as low as 35°F. Temperatures below 25 °F, especially for extended periods of time, can cause significant damage to citrus trees. During these cold periods, they will need to be moved into a protected area. During prolonged cold periods in the winter weather, citrus trees can be placed in a room with southern exposure and lots of natural light. Maintain the temperature between 55 °F and 65 °F. A humidifier or pebble tray filled with water can be placed near the tree to keep humidity levels high. If possible, a sunroom is the optimum location for indoor citrus during the winter. Removing dust from the leaves will benefit better photosynthesis along with helping to reduce the likelihood mites and scale insect problems. Containers can also be sprayed with horticultural oil or insecticidal soap prior to movement indoors to further decrease the likelihood of scale insect and mite problems. Depending on the species, citrus trees can get very large and will need to be repotted into a larger container every three to five years. Upon purchasing citrus trees, whether in a 4-inch pot or 3 gallon nursery container, it may need to be transplanted in a larger container that is 2” wider than the initial container. Depending on the species, the final container for your citrus tree could well end up being 18 to 36 inches in diameter. Another concern is the construction material of the container itself. Due to their lightweight plastic nursery containers, or decorative pots make good choices for growing citrus. Larger wooden, terracotta, or cement containers are too heavy, and are not the ideal choice for the average home gardener. Containers should also have adequate drainage holes. Figure 1: Proper and Improper Root Flare Placement. Proper placement of the tree into the container is also important. As planting with trees in the outdoor landscape, it is essential that the root flare is above the soil line in the container (See Figure 1). Proper planting with the root flare above the soil line will ensure that oxygen can reach the root system and help prevent crown rot. Planning for inclement weather events means the containers need to be moved relatively quickly and easily. A simple hand-truck or a plant dolly (plant stand with wheels) can help the average gardener move citrus trees around with relative ease. As with most container gardening, using native soil is not recommended. Native soils are often too heavy for the container. A good home-made growing media mix for Citrus would be: 4 parts shredded aged pine bark and 1 part peat moss or coir (cocoa fiber). This mix ensures high organic matter and good drainage, or buy a well-drained potting mix. If coir is used in the potting media, an application of agricultural gypsum (calcium sulfate) will be replace the heavy sodium ions with calcium ion, and help flush out other toxins that often are found in coir. Citrus trees grown in containers will need more frequent irrigation than those grown in native landscape soils. During hot, dry periods, trees will need to be watered almost daily. Before irrigating, check the top 2 to 3 inches of the soil to see if there is any moisture. The root ball should never completely dry out, nor should it be overly saturated for extended periods of time. Do not let containerized plants stand in a saucer full of water. If possible use rain water as it tends to have a lower pH than water from a municipal source. Citrus do well with a soil pH of 5.5 to 6.5. The application of Epsom salt (magnesium sulfate) and acidic, water-soluble fertilizers (such as Miracid) will also help maintain a lower pH. These fertilizers have more ammonium based nitrogen and sulfur contents, which helps maintain a lower the pH. Frequent watering of containers will consequently flush out essential plant nutrients. To prevent nutrient loss, a slow-release fertilizer, such as a 12-6-6 or a 12-4-6, is recommended for this application. 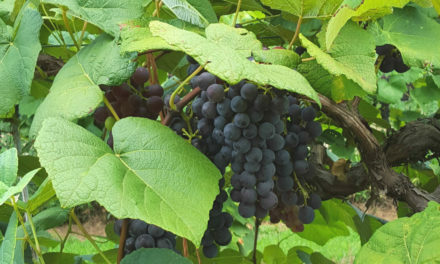 Several applications will need to be made throughout the growing season, depending upon the release rate of the product. The release rates of these products are both moisture and temperature dependent. The higher the temperature, the quicker the release rate of the nutrients. During the growing season citrus trees will need to 2 to 3 applications to maintain adequate growth. Supplemental feedings with an acidic water soluble feed may necessary to boost growth and correct nutrient deficiencies. It should be noted, that most water soluble fertilizers do not contain calcium or magnesium, so the application of Epsom salt (magnesium sulfate) and or agricultural gypsum (calcium sulfate) at 1 to 4 ounces per cubic foot of media may be necessary. Growing media can be tested by Clemson University’s Agricultural Service Laboratory. Upon submitting the sample be sure to ask for a “soil-less media test”. This is different from testing normal garden / native soil. For more information, please visit the Agricultural Services Laboratory website https://www.clemson.edu/public/regulatory/ag-srvc-lab/soil-testing/index.html. Most Citrus species are self-pollinating. Tangerines are the exception as they which require cross-pollination; therefore it will be necessary to have two or more varieties for proper pollination. The fragrant flowers will attract pollinators, such as honey bees and bumble bees. Typically, Citrus flower after in mid to late spring after a dormancy period. This period is defined for commercial citrus production world as 800 chilling hours (just over 33 days) where the temperatures are below 68°F. Flowering can also be induced by drought stress. Diseases: Citrus trees grown in containers are infrequently impacted by plant pathogens. The most serious diseases are usually root rots such as Pythium or Phytophthora root rots which may occur in a poorly drained medium. A concern to the foliage is Sooty Mold Fungus. It is a non-parasitic organism that grows on the honeydew of aphids, whiteflies, and soft scale insects. Sooty mold can cover green plant tissue that will inhibit photosynthesis. Proper management and prevention of these pests can minimize the prevalence of this problem. One major problem is Citrus Greening disease. This devastating bacterial disease is spread by the Asian Citrus Psyllid, an insect the size of a gnat. The psyllid was found in Charleston county in 2008 and there is now a ban on citrus plants being sold inside the county or shipped out from it. For more information on the quarantine, or of this bacterial disease, please go to the Clemson Regulatory Services site: https://www.clemson.edu/public/regulatory/plant-protection/plant-pest-regulations/state-plant-pest-information/pest-alerts/acp-cg.html. Caterpillars: Caterpillars can cause damage, but it is usually minor. In addition to attracting natural predators, pesticides containing Bt (Bacillus thuringiensis kurstaki), usually sold under the trade name Thuricide or Dipel. This natural bacteria is ingested by the caterpillars and then killed by a toxin the bacteria secretes in the insect’s gut. However, the bacteria is harmless to humans. Caterpillars are more susceptible to this bacteria when they are young. Caterpillars can also be controlled with products containing spinosad, commonly sold under the trade name Conserve. For control of additional Citrus Pests, such as scales, whiteflies, leafminers, mites, and mealybugs, please see HGIC 2221, Citrus Insects & Related Pests. C. aurantifolia – There are two main commercial cultivars of limes, ‘Tahiti’ and ‘Key’. ‘Key’ lime fruits are smaller in size and slightly more acidic. ‘Tahiti’ or Persian lime trees grow larger and produce less, but larger fruit. Home gardeners tend to have more of a sure crop with ‘Key’ limes, which actually have yellow skin when fully ripened. C. limon – Several different cultivars of lemons are available. The most common one is ‘Eureka’. This is the commercial variety found in grocery stores and is a true lemon. ‘Meyer’ is a hybrid variety that is slightly sweeter and easier to grow for the home gardener. C. paradisi – Two main cultivars of grapefruit are available, ‘Ruby Red’ and ‘Rio Red’. Both varieties are seedless and tolerate cold well. Grapefruit is typically harvested in the fall. C. reticulate – ‘Mandarin’ oranges are more acidic than their sweeter relatives. Though all Citrus flowers are fragrant, ‘Mandarin’ is noted for its extremely fragrant flowers. Tangerines are in this species. They tend to have a sweeter taste than other oranges, and do require two different varieties for pollination. C. sinensis – ‘Navel’ and ‘Valencia’ are two well known sweet orange varieties. Both are sweet and good for juice or fresh eating. ‘Navel’ is famous for its winter ripening in California. Among these two varieties, ‘Valencia’ is the more patio friendly and tends to be more readily available to home gardeners.